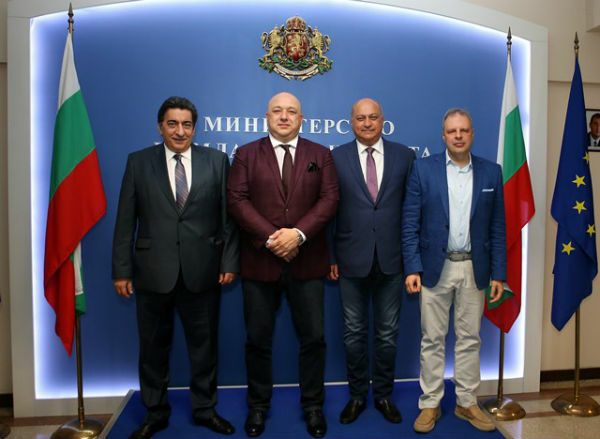 FIDE Deputy President, Georgios Makropoulos, together with ECU President, Zurab Azmaiparashvili and ECU General Secretary, Theodoros Tsorbatzoglou, after an official invitation received, met with the Bulgarian Minister of Youth and Sports Krasen Kralev in Sofia to discuss the situation of the Bulgarian Chess Federation. The purpose of the meeting was to clarify the scale and nature of the violations of the Bulgarian Chess Federation led by Silvio Danailov and to discuss the possibilities for restoring the membership and the position of Bulgarian chess in the world. Later they met with representatives of the Bulgarian Chess community, including representatives of the Board of the Bulgarian Chess Federation Vassil Antonov and Vassil Tonchev, MP Ruslan Toshev, Dr. Mihail Iliev, GMs Kiril Georgiev and Ventislav Inkiov, Head of Chess faculty of National Sports Academy Radislav Atanasov, and Deputy Mayor of Bankya, Plamen Simeonov. Afterwards they held a Press Conference, during which the Minister advised that there are two important aspects in the CAS Lausanne judgment. The first is that the court accepts that the competitions in the resort, Albena / Golden Sands are not legitimate competitions in the ECU calendar. The second, the money, which was translated as a fee from the Bulgarian state, was transferred to an account in Slovenia to an offshore company registered in Delaware, called “European Chess Union.” He reported that, according to the documents submitted by Bulgarian Chess Federation to the Ministry for the period 2011-2014, a total of € 1,070,140 was paid into the counterfeit account in question. Minister Kralev was categorical that he would turn to the Chief Prosecutor of the Republic of Bulgaria to help establish the scale of the abuse. “The president of the Bulgarian Chess Federation has consciously included this account in the contracts between the Federation and the Ministry. We do not know what the invoice is, and we do not know if other amounts have been transferred there, for example from sponsors of the Federation,” said Minister Kralev. He confirmed that the Ministry will seek the full amount allocated for the competitions in the resort. Albena / Golden Sands resort, not just a part of it, as the Inspectorate’s latest inspection. According to him, until it becomes clear with what amount the Bulgarian Chess Federation has cost the state, the Ministry can not rule on the license of the federation, which expired on 4 June 2017. “The Bulgarian Chess Federation, ruled by Silvio Danailov, has misled the Ministry by asking for a false league levy and has transferred the money to a false account and not to the ECU account,” FIDE Deputy President Georgios Makropoulos confirmed. In his words, the court in Lausanne has accepted that Silvio Danailov does know about this falsification, because at the same time he was President, both of Bulgarian Chess Federation and of the ECU. Such actions by Silvio Danailov, as well as his refusal to provide any official information and documents to the ECU have also led to the exclusion of Bulgarian Chess Federation from the ECU and it is currently undergoing a case in the FIDE Ethics Commission. He also explained that in his testimony at Lausanne, Silvio Danailov had tried to transfer responsibility for his actions to the whole Bulgarian Chess Federation Board. “We fully support the initiative of Minister Kralev, because we are convinced that he wants to help Bulgarian chess. We hope and believe that he will continue with these steps in the coming weeks. But I also want to emphasize that apart from his actions, we as FIDE cannot stop our procedures against the people responsible for these actions,” said Georgios Makropoulos. “We want to see a federation that we trust and we can work with. The problem is that today we do not know who we can trust in the current federation,” he added. “We are here to find a solution how to return Bulgarian chess to the European family,” said ECU President Zurab Azmaiparashvili. He said that at the meeting with the chess community, the representatives of the current Bulgarian Chess Federation leadership said they were not aware of the abuses and had not decided not to provide information to the ECU, as Silvio Danailov claims. “However, we can not trust people who have been members of the leadership and have not questioned, although they have had information from different sources, whether there has been any abuse in the federation and why ECU documents are not provided,” he added. All participants in the meetings united around the view that a new beginning of Bulgarian chess is necessary. “Everything is in the hands of chess clubs,” said Minister Krasen Kralev. According to him, a good option is to create an initiative committee to bring together most or all chess clubs in the country. “I know there are many honest people in the chess community. We can come out with dignity from this situation, as, of course, this sport will not be forgotten,” Krasen Kralev said. He stressed, however, that the future of this sport depends on chess makers in Bulgaria. The Minister was convinced that in any case the Ministry would not overcome the violations found in Bulgarian Chess Federation and would seek its rights.